This is the sun today – another cloudless day. 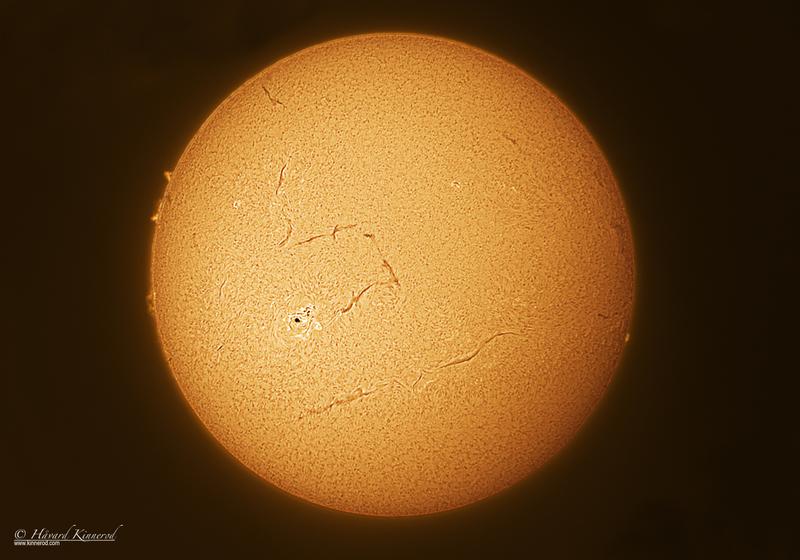 Best 300 of 1000 frames stacked in Registax. 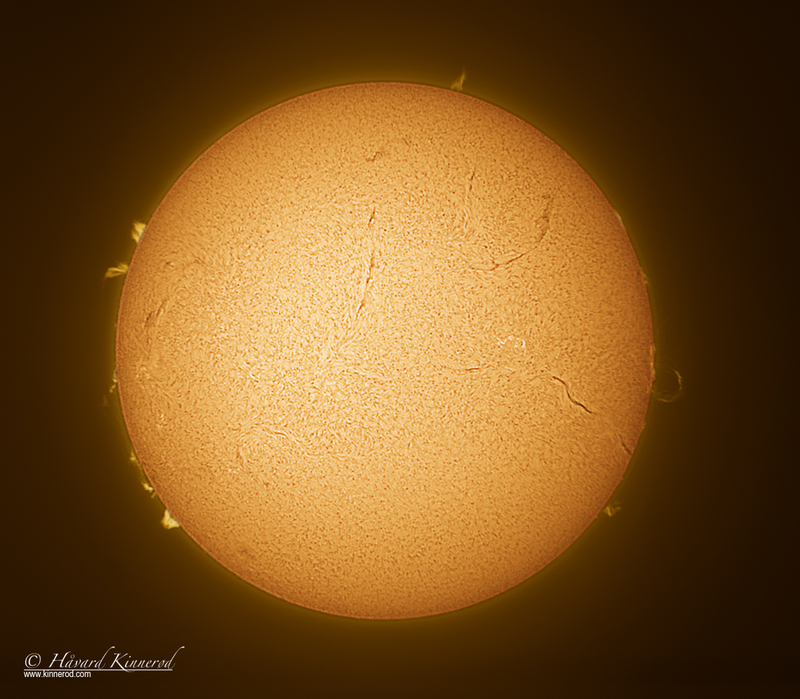 Captured using my Lunt LS35THa solar telescope and the IS DMK51AU02.AS CCD camera. First light for my new Imaging Source DMK51AU02.AS. I purchased this camera to be able to image the whole solar- and lunar disc in one image. This is an upgrade from my Imaging Source DMK21AU618.AS which has a smaller sensor. The sun is captured using IC Capture. 1000 frames for surface details and 1000 frames for prominences. 200-300 best frames was stacked and processed in Registax 6 and Photoshop CS 5. I have started to work on the Rosette Nebula. Due to the 45% illuminated waxing moon, I started with h-alpha. I managed to get 10 good exposures on the night of january 26th. I will continue to collect more h-alpha, and when the conditions are good enough RGB image data. 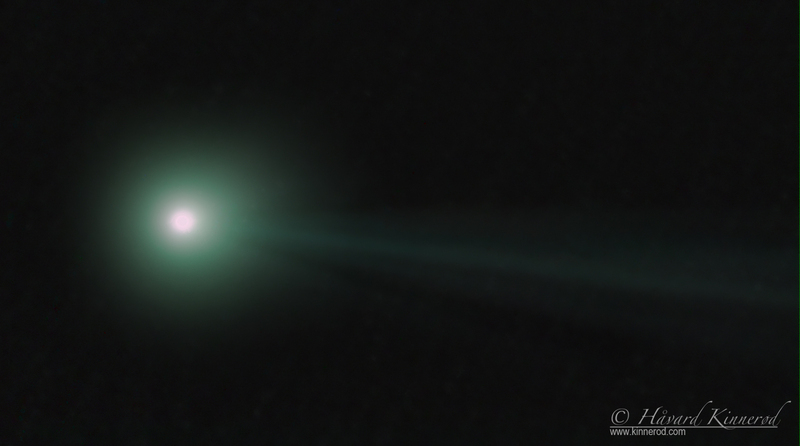 First light for my new telescope – The Takahashi FSQ 106-EDX III astrograph. After a few nights without clouds, but with rather poor conditions for astrophotography, I´ve managed to create this image of the Bubble Nebula. This is a HaRGB: 6x1200sec Ha + 8x300sec RGB. I tried to make a better image after a third night of exposures, but I was most happy with this image. I have 15 unused LRGB exposures for another edit. Comments: Processed using only images from two nights. Another 17 images in LRGB is available for another edit. First photo-session this season! Finally the nights are getting dark enough for astrophotography again. Having a clear night this weekend, and the Iris Nebula right overhead, I gave it a go. A 70% illuminated moon added quite a bit light to my suburban skies. After having my previous webpage for a little more than a year, I decided to move the whole thing to another server, and upgrade bouth the looks, and the “nuts & bolts” of the page. Since most of my followers don’t speek norwegian, I have changed from being an all norwegian site, to write in engslish! 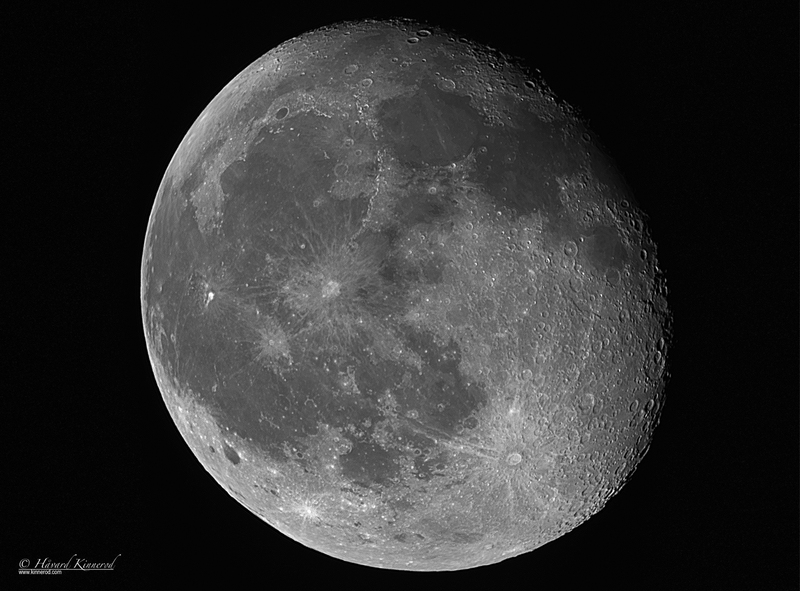 This is the first LRGB image I’ve taken with my new camera – the SBIG STT-8300 monochrome CCD.